Students tap into their unique interests and explore how our beliefs shape the world. The 11/12s social studies curriculum, World Religions, focuses on a study of the five major religions of the world and the roles they play within various cultures and societies. Students explore this complex topic through reading, film, music, and discussion. Because religion plays an important role in our contemporary society, current events are woven throughout the curriculum. The study of Eastern religions includes Hinduism and Buddhism. As one of the oldest, continually practiced faiths with almost a billion adherents, Hinduism offers a rich opportunity for students to explore the close connections between religion, geography, culture, and society. Next, students investigate the impact of Buddhism in Himalayan region and beyond and learn about the role of historical figures on the world’s faith through the life of Siddhartha Gautama. They consider the relationship of philosophy to faith and the role of contemporary Buddhism in both the East and West. We turn our focus to the Middle East as we study the growth of monotheistic faiths. We study Middle Eastern geography, the rise of Islam, and the continually evolving role of Islam in our world today. Students learn about Muhammad and the founding of Islam, read excerpts from the Qur’an, and learn about the artistic traditions of Muslim societies. At the end of the year, we explore the idea of personal belief by writing This I Believe essays. This national radio essay project was meant to bring Americans together and to help us respect one another’s differences. By sharing and writing their own This I Believe essays, students deepen their understanding of themselves and others. They reflect on their yearlong study of religion and create a piece of writing that captures who they are and what they think at this specific time of their lives. 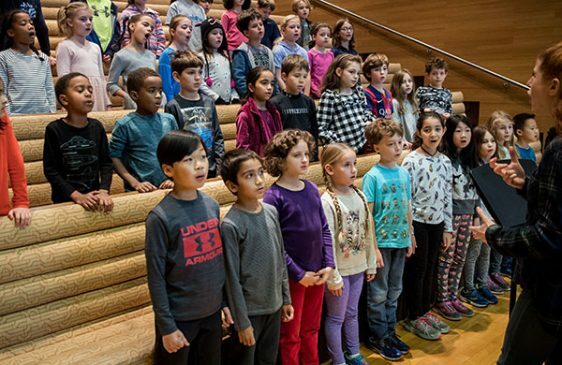 A highlight of the 11/12s is the nationally recognized, year-long curriculum: Loudness in the Library, which allows students to examine explicit and implicit biases in children’s and young adult literature. Students engage in rich, reflective conversations about race, gender, body size, and other social identifiers as they relate to books. The curriculum culminates in a field trip to Barnes and Noble, during which students research a topic of special interest (e.g., how many book covers on display contain people of color?). Students then work on two final projects: creating an “identity box” to share with their younger buddies and a redesigned or newly-imagined book cover that fulfills a need personally important to each student. 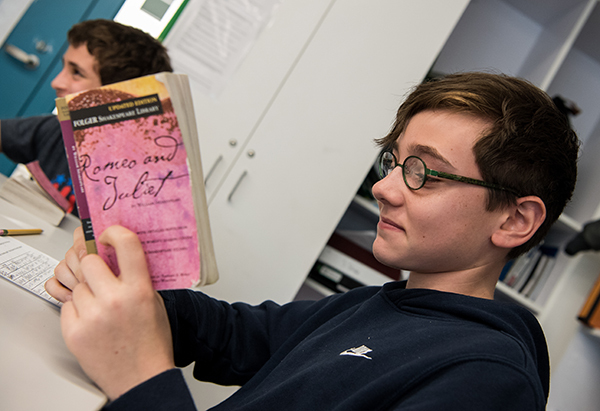 In literature, students explore what makes a book good. They read one book closely in book clubs and pursue a wide range of independent reading to select books they would like to promote for Bank Street’s Mock Newbery awards. Our Dystopian Literature unit allows students to read classics and modern books by author such as Ray Bradbury, Ursula K. LeGuin, Scott Westerfeld, and Paolo Bacigalupi. They analyze the elements of the genre with a view to writing their own dystopian short stories. Towards the end of year, we shift our focus to historical fiction. We read stories about individuals who braved immense hardships alongside nonfiction about the periods of history in which the novels are set. The 11/12s writing curriculum is aimed at developing strong organizational and expressive skills. The writing in the 11/12s, as in earlier years, allows students to express themselves creatively and also prepares them to write formal literary essays, research papers, and arguments. Students use writing to prepare for book discussions, to figure out and express their early thinking about big ideas in Social Studies and Literature, and to reflect on what they are learning. Students also engage in longer writing pieces with a deep revision process. They write expository pieces to describe what they have learned, formal arguments to persuade others, and narratives to tell stories and entertain. Our goal is to help students express their ideas clearly and beautifully. We integrate writing conventions, usage, and sentence structure the revision process. Because their ideas are growing more complex, a particular focus in the 11/12s is on writing and punctuating complex sentences correctly and on organizing paragraphs so that they are clear and coherent. In their library work, students in the 10/11s and 11/12s participate in the Mock Newbery program. Working with Bank Street’s Center for Children’s Literature, the children’s librarian solicits donations of current books appropriate for 10/11s and 11/12s. Classroom teachers tailor the curriculum to their students’ needs. Students practice and refine their critical thinking and public speaking skills by evaluating and discussing books eligible for Bank Street’s mock Newbery award. Students in the 11/12s are given a choice of continuing their study of Spanish or beginning a new study of French. Classes meet four times a week. Children must continue with their World language choices for three years. In the Spanish program, children study the geography of the Spanish-speaking world. They build on the knowledge of Spanish they have acquired throughout their years at Bank Street and continue developing their skills. They expand their language knowledge of useful topics such as clothing, traveling, and food through their exploration of specific countries. They create skits that integrate the grammar and vocabulary they have learned. The skits reflect real life situations that are culturally appropriate. They learn to order and buy food, to bargain in a market, to ask directions, etc. They have quizzes as well as homework assignments that reinforce classroom work. In this way, students read and write what they have learned to say. In the French program, students are introduced to a new language, develop an ear for French sounds, and acquire basic vocabulary and some simple notions of French grammar. Lesson themes are taken from children’s literature (stories, fables, and poems), authentic children’s games, and artworks from French-speaking cultures. Recent lessons have centered on the folktales of French-speaking West Africa, on the endangered animals of Madagascar, and on peoples and places of different Francophone countries. Children are introduced to the diversity and cultural richness of French-speaking countries. Although themes may vary, each lesson contains the same groundwork material children need to know to continue in French. Students are introduced to reading and writing French through classroom activities and homework. 11/12s students are actively involved in the learning process as they develop sound mathematical habits. 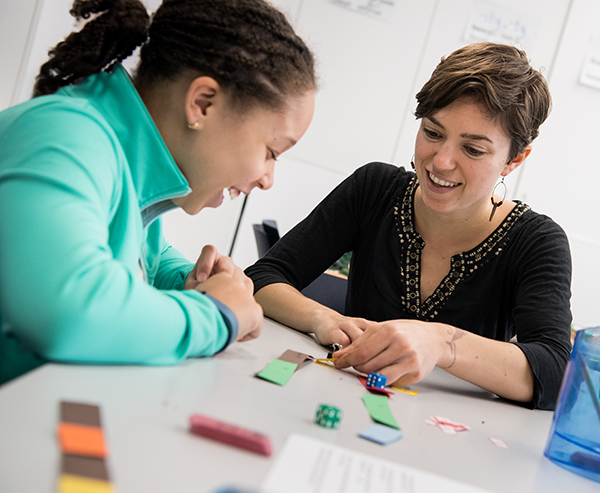 Students explore mathematics as a language of communication and reasoning. They learn important questions to ask themselves about any situation that can be modeled mathematically. They use mathematics as a tool for solving a wide variety of problems, involving many different approaches and styles. Students learn that it is more important to be able to explain their mathematical reasoning than it is to get a “right answer” by following an algorithm without understanding their process. We focus on strengthening students’ skills in the areas of accuracy, note-taking, study habits, organization, and test-taking skills. The 11/12s math curriculum strengthens and expands on students’ work in all mathematical operations with fractions and decimals. Other topics include: measurement, ratios, proportions, percentages, 2-dimensional geometry, and probability. In 11/12s science, students design and carry out experiments to answer questions class. They complete each investigation by analyzing the data from experiments and making meaningful connections. The sun as a source of energy. The atmosphere’s role in our planet’s radiation balance. The properties of water that support the existence of life on earth and the importance of maintaining unpolluted water sources. Students explore the human impact on the atmosphere and groundwater. They search for the best solutions to environmental problems and explore the political realities of how choices are made. During late January and February, students work on an independent investigation into a question related to earth science. They work in small groups to devise and refine an experiment to answer a question; collect and analyze data; draw conclusions based on this analysis; and present these findings at Science Expo. 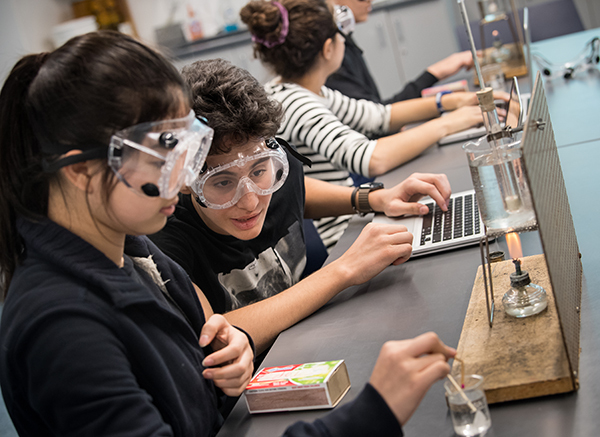 The Upper School technology program is developing quickly. The 11/12s classrooms use a range of technology for instruction, documentation, and collaboration. The 11/12s are gaining confidence in their ability to express their ideas visually. They are beginning to question how to achieve realism in their work. With that in mind, the art room offers opportunities to continue developing their understanding of the human figure, starting with a focus on proportions and movement. Students measure their own body parts and establish the proportions of a figure. Later, they create collage and drawings that continue to explore this theme. In painting, the concept is expanded by introducing the students to thinking about near and far away. While looking at the work of artists, photographers, and illustrators, they begin to define how to best achieve the illusion of space. Working in clay, the 11/12s become architects and interior designers. They create their own “fantasy rooms” where attention to scale, detail, and spatial relationships are explored. 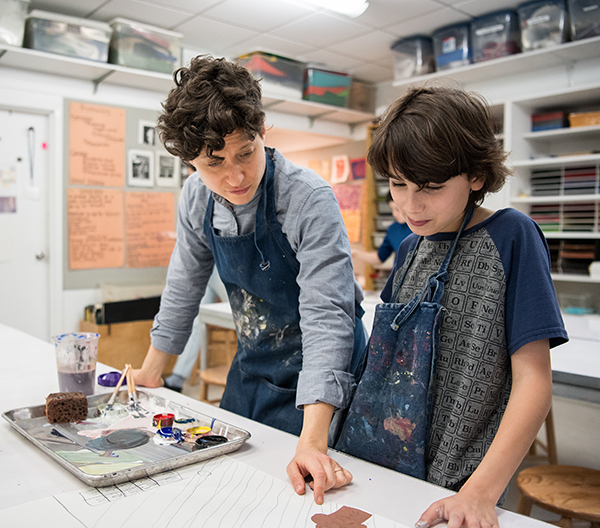 In the spring, 11/12s participate in a longtime Bank Street tradition by designing images for the school calendar using printmaking. When the weather permits, students also draw landscapes from observation. 11/12s students begin the year with an improvisational sculpture in wood. They learn to create shapes by removing material, developing primary shapes, secondary angles, and other nuances particular to their subjects. Next, students begin creating art for social justice. Thinking about what they might want to do as adults to make the world a better place, they create figure sculptures of themselves as adults engaged in that action. Throughout students’ work process, we meet as a group and in spontaneous conversations to discuss their future aspirations and the issues that are currently on their minds. The Upper School music curriculum has three main parts: music history, music theory, and making music through singing and playing instruments. Music in the 11/12s focuses on the history of American popular music starting in 1955. We start with the roots of rock ‘n’ roll and then proceed through the various genres of popular American music, including doo-wop, R&B, British Invasion, folk and folk/rock, Motown, soul, funk, and hip hop. Students are assigned several musicians to research and they share what they have learned with their classmates. The 11/12s also complete ear training exercises and continue to review note reading through classwork and homework. In guitar class, the students learned to read chord diagrams and perform basic strum patterns. By the end of the year, all 11/12s should be able to play I-IV-V progressions in several keys on the guitar. We also have “Share Days” so that students could share their accomplishments with their classmates. There are two choruses in the Upper School—one for 10/11s and 11/12s and one for 12/13s and 13/14s. Both groups learn a diverse array of music, including classical, spiritual/gospel, folk, and contemporary pieces. Students in chorus work on vocal concepts such as proper breathing, vowel placement, diction, posture, and harmonizing. The choruses perform at the Upper School Winter and Spring Concerts. 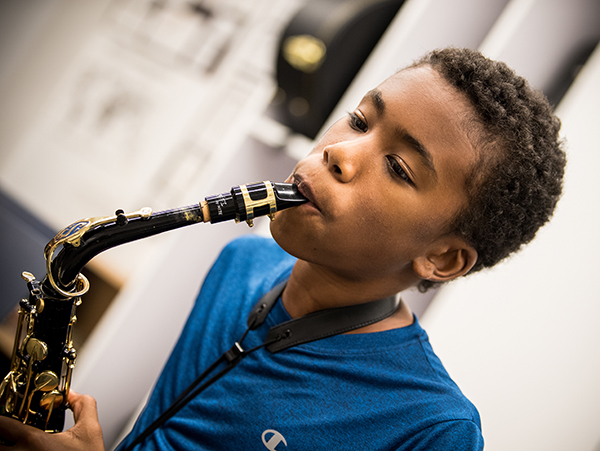 In addition, Upper School students can participate in a variety of instrumental music opportunities, including eight rock bands, a string ensemble, and a wind ensemble. 11/12s students have gym four times per week, for 45 minutes, meeting twice per week in the gym, once on the rooftop play area, and once in a multi-purpose room for fitness activities. The program focuses on meeting the interests and capacities of all students. We strive to engage all students in every class and to make this an enjoyable, dynamic, exciting, and safe place for all children. We provide broad exposure to a wide range of physical activities to help students develop an enjoyment for movement and games that will evolve into physical activity throughout their lives. 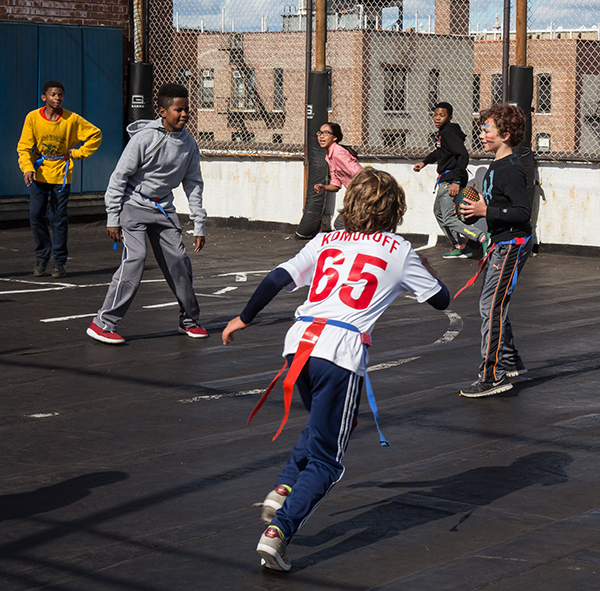 We further develop the knowledge of rules, strategy, and skill levels in activities introduced in the 10/11s. Some of the sports and activities offered include team handball, football, soccer, basketball, badminton, hockey, volleyball, softball, Frisbee, and group games. Stretching, aerobic exercises, and upper body strength activities increase fitness levels. Optional after school interscholastic sports include soccer, softball, basketball, and track-and-field. Students are given many opportunities to take on responsibilities for their own play and development. At times, team captains are assigned and are responsible for strategy, lineups, set-up, and clean-up. They learn how to settle differences quickly, fairly, and peacefully. They occasionally officiate the games. The 11/12s examine the implicit and explicit messages in children’s and young adult literature, advertising, television, movies, and other platforms of media to understand their effects on how they think about race and gender. Students also delve into the history, beliefs, and practices of the major world religions: Buddhism, Christianity, Hinduism, Islam, and Judaism.